Chocolate chunk cookies with peppermint are gluten free, egg free and vegan Christmas cookies that will wow everyone! These vegan chocolate cookies are so fudgy and delicious, nobody will be able to tell that they’re allergy friendly! Well… Hey there almost December! I’m about to bombard you with a week of christmas cookies. Don’t run, don’t hide! 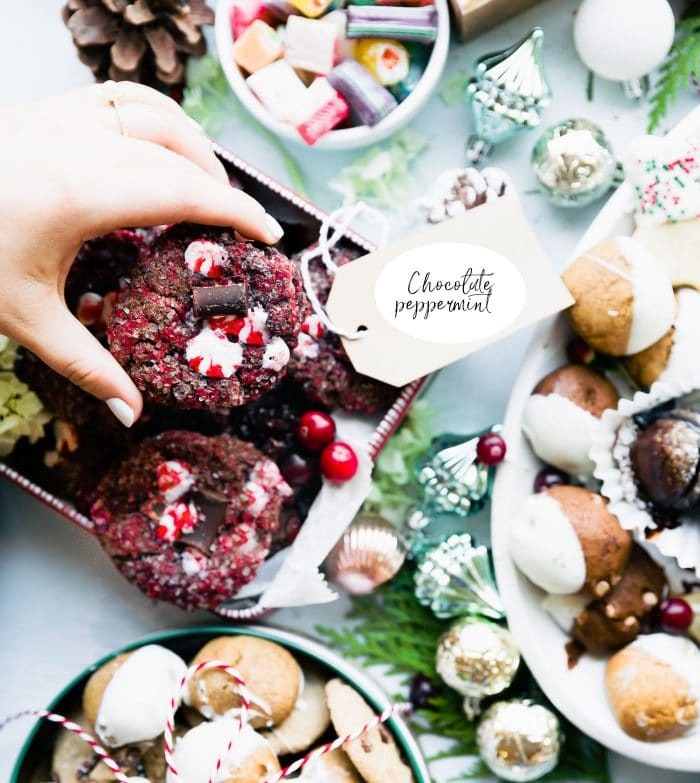 These are the best of the best gluten free christmas cookies that are (for the most part) refined sugar free with vegan options. GASP! I may be bias, but please believe me when I say I have had them tried and tested 3x! 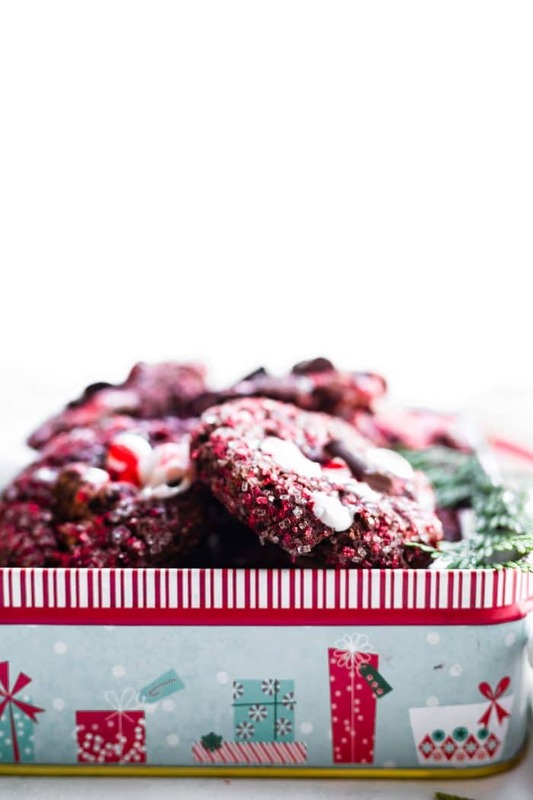 My kitchen basically exploded with holiday baking ever since these thumbprint cookies. Anyways…. let’s kick it off with a little peppermint and chocolate chunk magic. Mmmm k? Chocolate chunk cookies with peppermint! Yep, a favorite holiday cookie of nearly everyone, but when you bake a batch that is vegan, gluten free, and egg free? 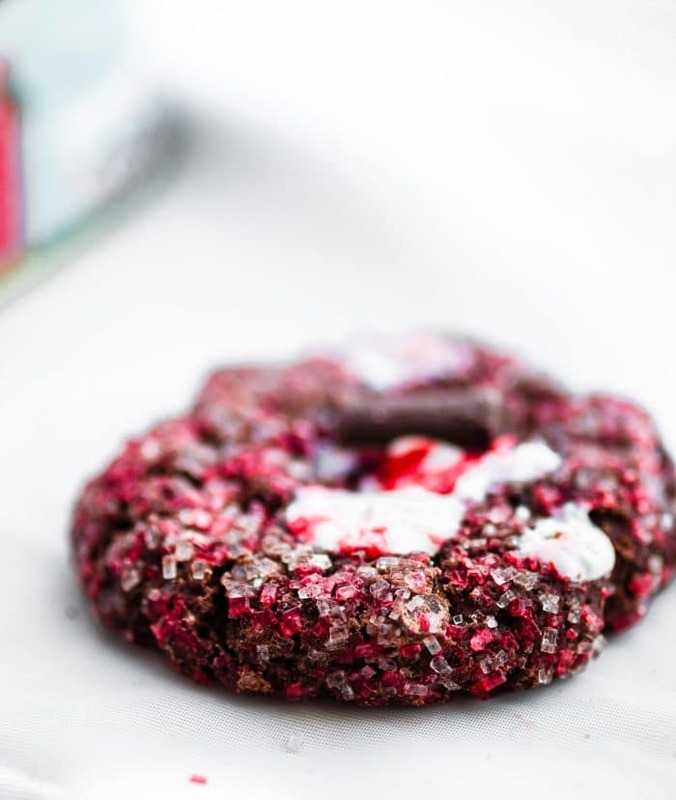 Well, that just makes these vegan Christmas cookies downright addictive! Commonly Asked Questions …. 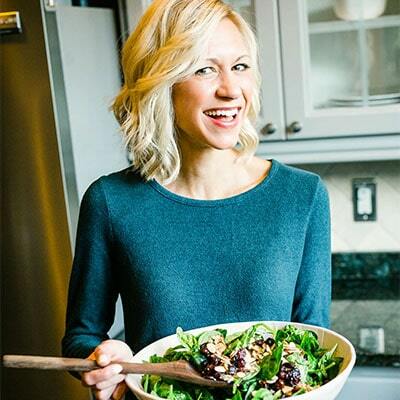 about gluten free (and egg free) cookies! Questions that inquiring minds need to know. Also known as, give me the low down on these vegan chocolate cookies, Cotter. What’s in a vegan cookie? I think it may be easier to explain what isn’t in vegan cookies than to explain what is in a vegan cookie. You know what I mean? Vegan cookies (and for that matter, all other vegan recipes) have no animal products or byproducts in them. Here’s the thing, though. 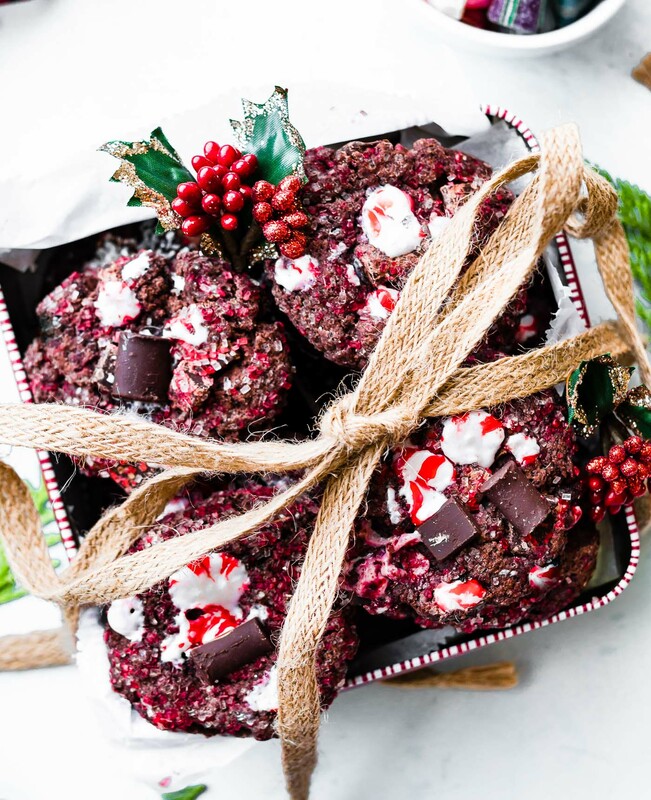 This recipe for Peppermint Chocolate Chunk Cookies is also egg free and gluten free, you will find NO eggs, wheat, bulgur, or rye flour in the recipe, either. 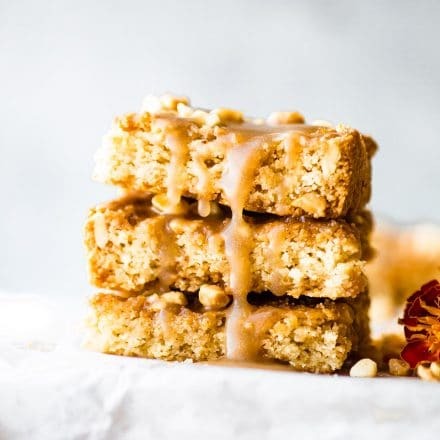 Some of my favorite cookie recipes are vegan. 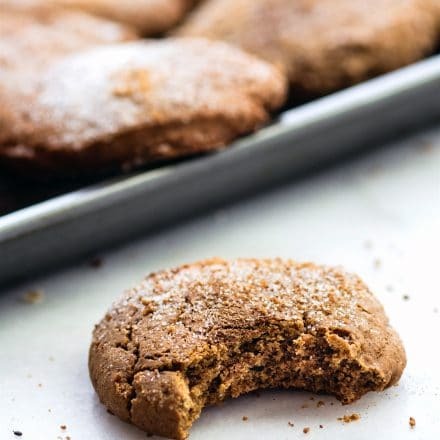 Have you tried these vegan cookie recipes of mine yet? Now that you know what isn’t in the Vegan Peppermint Chocolate Chunk Cookie recipe, let’s talk about what is in them. I know what you’re thinking, if all that is missing from a cookie, then what good stuff is left? It’s all good stuff YO! And no, they don’t taste like cardboard. Pinky promise! What’s in a vegan chocolate chip cookie? Technically chocolate chunk cookies are chocolate chip cookies, with more chocolate. Right? And since we know that chocolate has anti-inflammatory properties, it only makes sense to use MORE chocolate. Hence, the chocolate chunks. 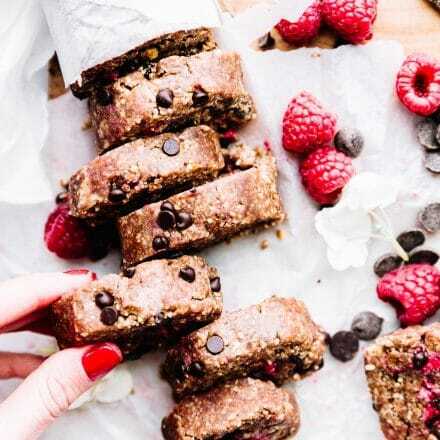 In addition to the chocolate chunks (which, by the way I buy from Enjoy Life Foods), this chocolate chunk cookie recipe also calls for a few other simple ingredients you probably already have in your pantry! 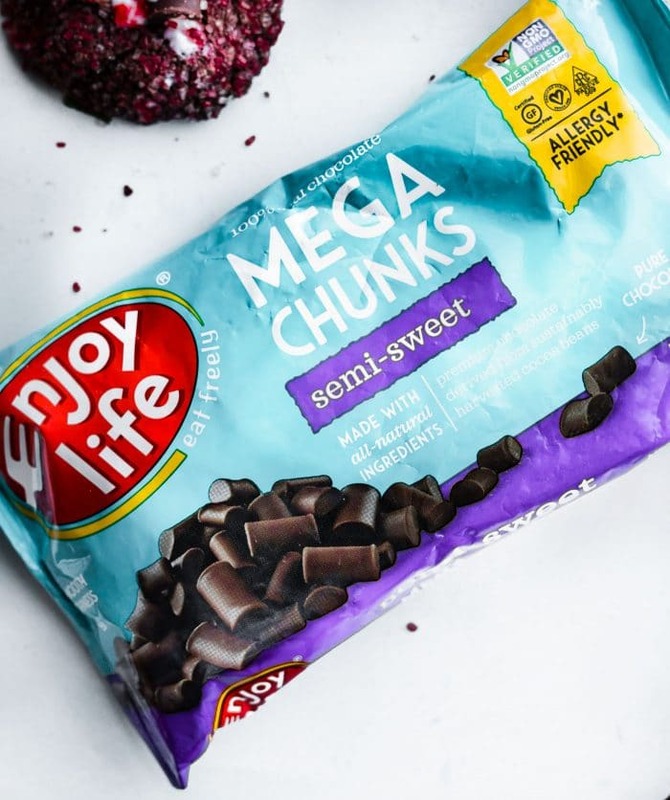 You can use dairy free chocolate chips OR chocolate chunks in the cookies – you can get either/both from Enjoy Life Foods. Using a gluten free flour mix like Bob’s Red Mill 1:1 GF flour does wonders, too. I also used a vegan butter that actually tastes like butter. But if you don’t have vegan butter, don’t worry, coconut oil works just fine. Or real butter if you are not vegan. Need some tips for making that peppermint shine? I love using real peppermint extract with a touch of vanilla, OR 2 drops of peppermint essential oil for a more soothing aftertaste. This is the combo that makes Christmas shine. Delicious Vegan Chocolate Chunk Cookies with Peppermint! Gluten Free and easy to make Christmas cookies! In a small bowl, beat the butter (or coconut oil, not melted) and the sugar together and beat with electric mixer until creamed together. Around 2 minutes. Add the optional vanilla if desired. vanilla and mix in. In another large mixing bowl, Sift the gluten free flour and cocoa powder together then add in your basking soda and sea salt. Combine your wet ingredients with the sifted flours (dry mix). Beat or mix thoroughly. Batter will be thick. Add your milk and peppermint extract and mix again. Fold in your chocolate chunks and crushed peppermint (around 1/3 to 1/2c). Once the batter is mixed, roll into golf ball size balls. Coat eat cookie dough ball in sugar crystals or sprinkles (optional), then place on baking sheet. Press down with palm of hand or I like to use the back of a coffee mug (greased). Sprinkle your extra peppermint on top of each flat cookie. Place in oven in center wrack for 12-14 minutes depending on the thickness of your cookies. Remove from oven and let the cookie cool on tray before touching them. They will set and hardened as they cool. Store in ziplock bag or container. Best kept in fridge but room temp will be fine for 5-7 days. Freezer friendly. Estimated Nutrition below with raw sugar. Preheat the oven, let’s do this! 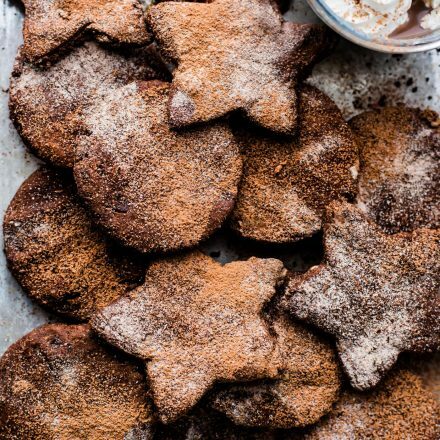 To conclude –> Making Christmas cookies without eggs isn’t hard at all. The best part is, no one will ever know they are VEGAN Christmas cookies! Okay friends, that’s all I can reveal for now. I have 2 more cookie exchange posts/recipe coming up next week that will go into more vegan baking detail. Sound good? For now, save this recipe or give it a whirl this weekend. You might be surprised at how easy they are to make (and eat). Obviously. Tis the season! Let’s just make sure the season is balanced with oh say… some nourishment. These are the most festive cookies ever! These cookies look soooo good! Perfect for Christmas! Now these would make the perfect gift for my GF friends! They look absolutely delish. Thanks for all the tips! Anything with chocolate and peppermint is a WIN! 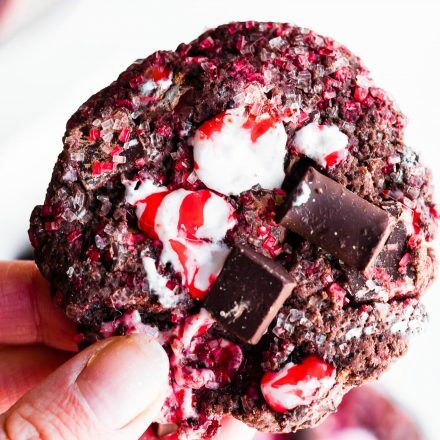 Chocolate peppermint cookies are perfect for the holidays! These are so festive! I would NOT be complaining if someone gave me these for Christmas! I could eat a whole sheet of these! Thank sweet baby Jesus for cookie season! 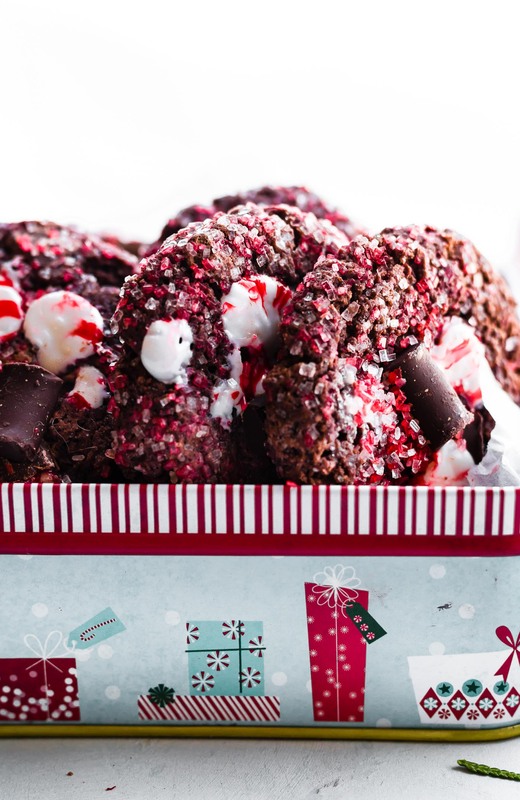 Nothing better than peppermint and chocolate together – and it cookie form, how could it be wrong? You are the vegan cookie Goddess. I bow before you. I love the Enjoy Life brand. It’s what I use for all my City Hippie granola flavors too. aren’t they the best? Truly a blessing to have wonderful products! Can I use regular flour and regular sugar if I’m. 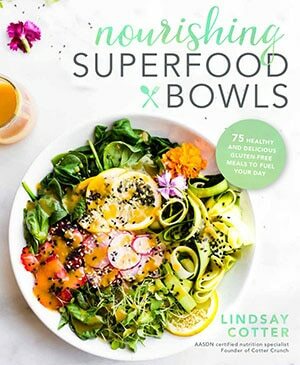 If I’m not going for gluten/sugar free?